Here is my gold prediction (silver and gold mining stocks, should be the same) looking forward 24 months. Since the top in gold in 2011 gold has selling off. Depending on how you analyze the market, this 3 year sell off could be seen as consolidation within a major cyclical bull market or that it's in a bear market. But know this, either way, the outlook is bullish, and all gold has to do is find a bottom here and rally above the $1400 per ounce level. This would kick start a major feeding frenzy of gold buying. Gold bear market in the past have on average corrected 33% and lasted a total of 550 days. So if we look at the stats of the current pullback in gold it has dropped 38% and about 700 days long. Time for a bottom and bull market? It sure seems like it. Gold remains in a down trend, but looks to be starting a possible stage 1 basing pattern. Technical analysis is pointing to strength as the MACD moving higher, relative strength, and the down trendline show price and momentum being bullish. A few weeks ago the chart completed a Golden Cross. This is not shown on the chart, but it is when the 50 SMA crosses above the 200 SMA. Investors tend to look at this as a major long term buy signal, although I do not use it for any of my analysis or timing of the market. If historical data, statistics, and technical analysis prove to be correct we can expect gold to rise. 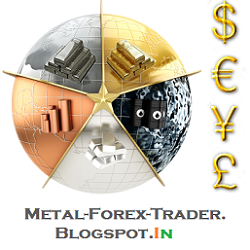 My gold prediction is for price to reach $2300 - $2500 per ounce within 24 months. The average gold bull market last roughly 450 days and posts a gain of 95%. So with the current correction which is beyond these levels already, expect price to firm up this year and complete the stage 1 base. 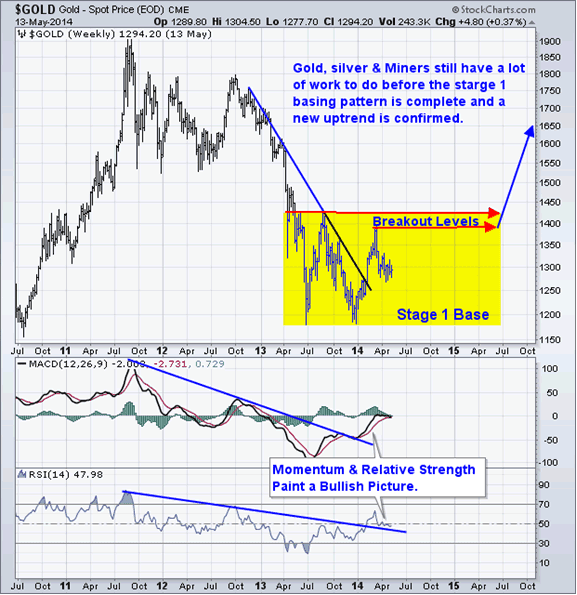 Note that until gold breaks out of its Stage 1 Basing pattern, I will remain bearish/neutral on the metal. There are huge opportunities elsewhere unfolding.